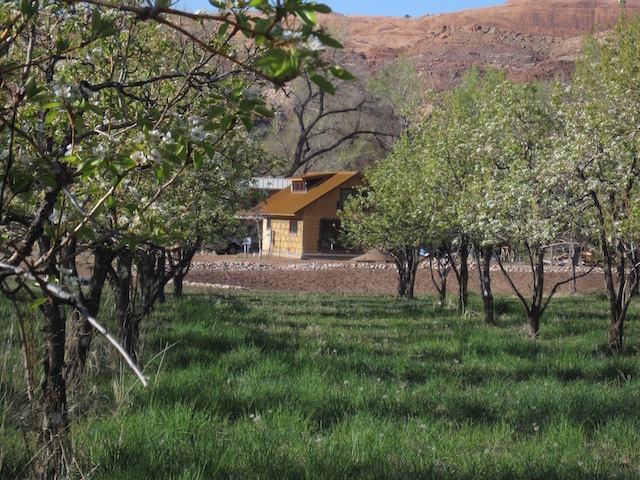 Orchard and strawbale home at Moab’s Mulberry Grove. Photo by Kalen Jones. Juxtaposed against Moab’s red rock landscape, the paved path down the urban section of the Mill Creek riparian corridor can feel like Alice’s Wonderland. 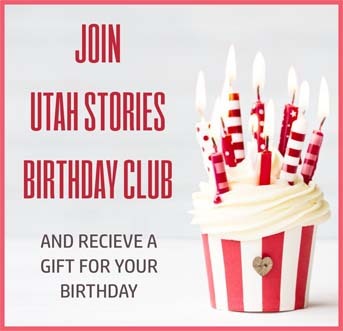 Following a perennial stream, the verdant parkway meanders across bridges and through underpasses past gems like the Youth Garden Project, the city dog park, Utah State University Moab, and a well-maintained community bike jump park. Along the far east end near Rotary Park, a welcome sign beckons pedestrians and bikers off the parkway into another unique Moab creation, the Mulberry Grove neighborhood. Curious wanderers will find themselves in a community where homes have covered porches facing the walkway, the neighbors share 11 acres of preserved open space, and almost everyone parks their cars in lots on the outskirts to walk the rest of their way home. When Mulberry Grove resident and development team project manager, Michelle Wiley, sits on her front porch in the evenings during the height of visitor season, she spends a lot of time chatting with visitors who have discovered the Millcreek Parkway. 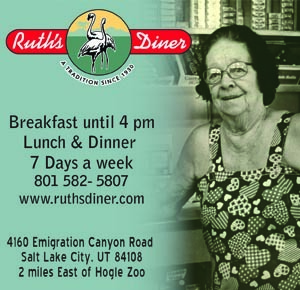 In the late 1990s and early 2000s, as the city began experiencing exponential economic growth, many permanent residents saw a need to preserve the regenerative, life-giving qualities of the natural landscape that attracted them to Moab in the first place, according to architect and Mulberry Grove development partner, Kalen Jones. When the agricultural land that is now Mulberry Grove was put up for sale soon after the completion of the Mill Creek Parkway, he, Wiley and others saw an opportunity to put the vision of intentional development to work. “We did have some trepidation about being overly-visionary,” Jones recalls with humor. Though initial response to the development’s design was skepticism and even hostility in some cases, today Mulberry Grove is a popular connector for bike commuters, and destination for neighbors out for a stroll, Wiley says. The last of the development’s 42 building lots sold in the summer of 2017, and homeowners in the neighborhood include young families and some who qualified for USDA rural development grants. The result has been the growth of a dynamic neighborhood with a village-like culture, where she knows and talks often with her neighbors.